Half of the applets did not load correctly... I have complained about this before but it doesn't hurt to complain again. A refresh sorts this out. It may be some kind of time-out loading applets. For some reason Vista has arbitrarily decided to change the current view to large icons. 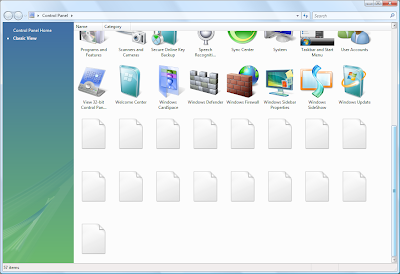 It likes arbitrarily changing the views of folders you see. This is incredibly annoying. PS: Another annoyance is when you try to execute a large downloaded file (or something like that, there may be other factors involved). Nothing happens for several minutes whilst it verifies a digital signature or whatever. You'd think they'd know better and show some kind of progress dialog. Even worse, it can leave you wondering if the double click registered so you may double click again. Now try doing that over a network..